The main group of youngsters, Erin, Eric, Kyle, and Mr. President started from the PCT trailhead off Santiam Pass just after 2pm. We were to meet two experienced mountain men, known in the city as Mark and Byron, at our base camp at Summit Lake, roughly 4 miles from the civilization of the parking lot. 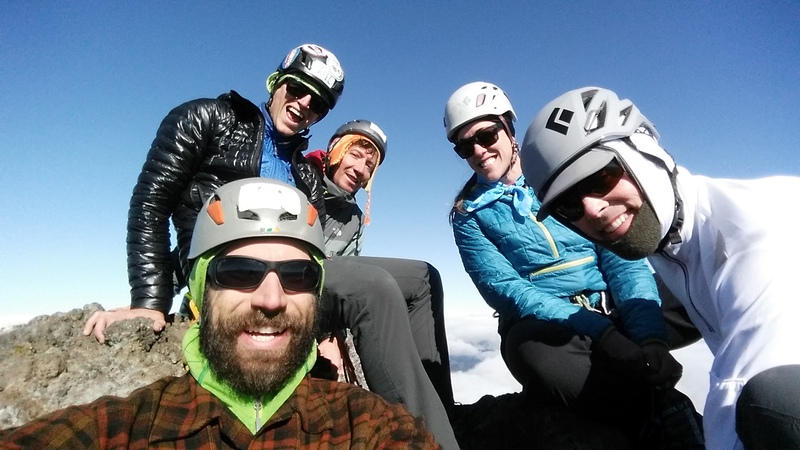 Our goal was the South Ridge route, known for its rad exposure and summit chimney pitch. The hike was misty from the start, not too bad, but about 2 miles in we donned our raincoats in an attempt to halt the ensuing downpour. The hike was pretty mellow, the colors and rain showed fall was here, but we were in good spirits for one last summer summit. In roughly 2 hours we were welcomed to summit lake and reunited with our climbing companions. As we set up camp, Mark made a nice, legal, warming fire and our last comrade, Julio made his way into camp. The rain was sporadic, the fire majestic, the freeze dried meals edible. Cookies and adult beverages were had as we discussed our summit plan for the next morning and toasted the first day of fall. Departure time was set for a brisk 6am. The morning was frosty and in the 30s, we were maybe a little slow to depart as it rained on and off through the night and we wanted the rock to get a chance to dry out. We broke into two teams, the youngsters set off first and hauled ropes and gear with the goal of fixing lines for both teams in the name of efficiency. We broke from the PCT onto the climberâ€™s trail, slogged up some frozen sandy scree, and gained the ridge in no time. Before we knew it, we were at the â€œcrawl,â€ a slightly awkward, narrow traverse with awesome exposure, and less awesome rock quality. This is where the real climbing started. This was essentially the crux of the route, not so much for its moves, but its head game. As we started to harness up, we saw Mark and Byron start the climberâ€™s path up the ridge. Timing was perfect and we had the whole mountain to our SACselves. Kyle belayed Andy thru the crawl, using existing pitons for protection. He made it look easy, almost fun, and secured the line for the team. He continued up the ridge with another rope to protect the scramble to the saddle. The rest of the youngsters quickly but cautiously followed our fearless leader and we reunited at the saddle, ready for the final 1.5 pitches to the summit. As Andy started leading the final block, we saw Mark and Bryon reach the traverse. We were warned of Bryonâ€™s love for exposure, and we were all pumped to see him get to the fixed line, wondering how much fun he was going to have. Andy secured a sling atop the 5.FUN chimney, Eric followed, then Kyle. With three at the anchor, Andy continued the final 30-40 feet to the summit and set another anchor. Within 30 minutes, we all shared a ridiculous view on the Summit! Smiles and hi-fives were had, and we rappelled back to the saddle to greet Mark and Byron, who had just arrived and were ready for their summit pitches. We left our anchors and ropes on the summit block, allowing Andy to quickly reclimb the first pitch via top rope, and then top belay Mark and Byron up. Just like that Andy gained his 2nd 3FJ summit of the day, Mark his second of the year, and Byronâ€™s first in an impressive climbing career. This was when everyone felt the most accomplished, as our goal was for the entire team to succeed, especially Byron who had been shut down on previous attempts due to crowds or poor weather. Spirits and morale were beyond high. We downclimbed the fixed lines, gathered our gear, and descended the maze of scree among a herd of mountain goats back to our camp. We were out of beer, Bryonâ€™s knees were feeling the burn, and we were losing sun and warmth quickly. We packed and left camp in waves. The hike back to the parking lot offered the amazing views of the Sisters, Mt. Washington, and Broken Top that we did not get thru the rain on our approach the previous day. Kyle, with thoughts of Poppa Alâ€™s famous burgers flying thru his head, decided to strategically place a borrowed presidential trekking pole on top of the car. As we retreated to the city, the pole was left as an offering to the highway shortly after we turned out of the parking lot. Rumor has it, it remains among the brush to this day. I have a jetboil Sumo. Iâ€™ll be driving from Portland but have to stop in Salem to drop off my dogs. Iâ€™m happy to ride w someone or drive and carpool. Either from Portland or Salem. Here we go again....anyone close to Nopo or NE that wants to hook it up with a ride? Thanks again!